Board games allow us to live many fantasies, but one of the most tantalizing is the dream of being able to do everything. We, as people, have been trained and encouraged to accomplish goals, to create and build, to fulfill our dreams into physical reality. In this manner, Orbis understands that innate desire and uses it against us in devious and ultimately effective ways. Orbis tasks each player to create their own universe, complete with a unique god. The goal? Have the most Creation Points, aka CPs after 15 turns, giving you just enough time to erect your grand pyramid. Pyramids are composed of 5 layers, each containing fewer and fewer tiles until your deity stands tall atop the lands, looking down on… oh… oh jeez… yeah, that did NOT turn out well, did it? Much of this abstract tile-laying experience relies on both extensive planning for various opportunities and tactically reacting to new tiles as they are flipped. On their turn, each player must draw a tile from the 9 that are available, resulting in a cascade of effects. Firstly, players take whatever worshipers are on the tile they are claiming. Worshipers act as a non-descript currency used to pay for the tiles that you place throughout the game and resolving effects on said tiles. Additionally, when claiming, let’s say, a blue tile, a blue worshiper is placed on each tile in the market. This creates a loop of determining how to manage your own resources without leaving too much good stuff for everyone else. Then, taking the tile in hand, the player must pay it’s cost, ranging from 0 to 6 worshiper cubes. This can be daunting, especially when you have 5 different colors to work with, but its helped by being able to exchange any 3 identical worshipers for 1 of your choice at any time, allowing you to plan for flexibility if need be. Placing the tile, though, that’s the tricky part. If you’re placing in your first row, sure, whatever, put it wherever you want. Once you have 2 tiles to support it, yeah, you can put a tile in your 2nd row, and so on. But here’s the kicker; you can only put a tile in an upper row if one of the tiles below it is of the same color. In other words, you’re building a system that relies on you focusing certain colors in the long-term in order to build a system that earns you points and doesn’t leave you with less than optimal options. Tiles earn you points in several ways, like building matching tiles around one another, destroying worshipers from the board or your personal supply, or by collecting the most temples by end game. Each color has its own rules, giving you the opportunity to plan in a variety of ways, suiting your playstyle. Want a lot of cost mitigation late game? Start grabbing some yellow tiles. Want to build a steady stream of a single color? Blue might be your go-to. Each provide unique yet familiar options that allow you to mix and match as you see fit. But perhaps you can’t pay the hefty cost, maybe you find yourself unwilling or unable to place a tile. Well, then you’ll just have to flip that tile over, revealing the barren Wilderness. This tile is a wild, thus able to go anywhere on your board and counting as any color for placement and points purposes. However, each Wilderness tile provides you with -1 CP, cutting into your end-game scoring. This creates a certain balance, as players have to question how willing they are to spend the CPs in order to have better flexibility, maybe getting more points in the long-run thanks to the sacrifice. Lastly, one has to consider when they intend on taking their god; similar to the Nobles in Splendor, a number of these are randomly selected and laid out to the side of the board, each with their own scoring parameters. 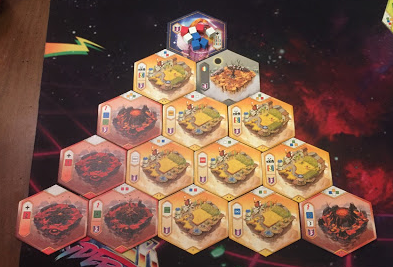 Rather than taking a land tile, players can choose on their turn to reserve their one god tile, which will earn them 1, 2, or 3 points if their manage to fulfill the provided objective. Some require you to collect certain tiles, others sacrifice worshippers, and some giving you few points but a passive buff to their game. These buffs are minor, but can add some guidance to a game that can sometimes feel difficult to tell the best path forward. While Orbis ultimately naturally limits your options as the game goes on, there’s a feeling of wanting to do everything from the start. You have 5 slots in your bottom row, meaning you can entertain all 5 colors at some point in the game before cutting down on your selection. And often players try doing just that, misunderstanding the ideas within the game mechanics. Yes, you can totally spread yourself thin for the sake of flexibility, but you can inadvertently restrict yourself. Blue and green scoring tiles rely on particular board layouts, often requiring those colors to take a specific form to allow for them to be scored successfully. Rather, Orbis rewards those who focus on 2 or 3 colors, allowing you to tap into certain aspects without taking on too much. Your ability to do this, however, is often dictated by the flop of the tiles. When each color is available and whether or not you can realistically afford said tiles can leave players in a very literal no-win situation, which is never fun to experience. In this way, this game courts a dichotomy of careful planning and praying for the right things to come out at the right times, which works most of the time but can lead to some difficult moments that have turned certain players off from the get-go. It’s not a fun feeling to have your game come to a screeching halt as you scramble to make something good of a crummy situation. And yes, to some degree this can be blamed on poor planning, but even the most thoughtful players have fallen prey to it, especially on their first go around. What’s more,if each player tries to focus on 2 particular colors, inevitably it leads to 1 player getting completely skunked in a 4 player game, as 5 colors need to be spread out amongst the players. If competing for a particular popular color, you can find yourself adrift and without a chance for recovery. Playing with 3 or 2 players helps this issue dramatically, but also limits the flexibility of the game. I think what was most telling about my experience with Orbis was, no matter how frustrated a player may have gotten or how awry their plans may have gone, every single players ended up saying, “Yeah, I’m gonna want to play that again” Space Cowboys have presented a puzzle that has clearly keeps players entranced, wanting to delve further into its simple design to determine just how far one can dive. Like a the colorful love child of Kingdomino and Splendor, Orbis remains an appealing and intriguing riddle.It is a finite experience, one that will likely become tired with overexposure, but it makes you think in creative and satisfying ways that good abstracts tend to, working your brain while letting you relax with some friends. If you find yourself in need of another gripping head-scratcher to adorn your shelf, this is a game you should certainly consider. Who Should Get This Game: Anyone looking for a clever, thoughtful Rubixcube of a game that’s grown tired of classics like Splendor. Who Shouldn’t Get This Game: If you’re easily frustrated by rules or need a deep theme to carry you through a game, you can pass this one by. Review copy of Orbis has been provided by Space Cowboys.